• September 2005, the Jonas Brothers performed LIVE at the Saint Louis Galleria to celebrate the Grand Opening of our Friends 2B Made store. The F2BM store is about to open! 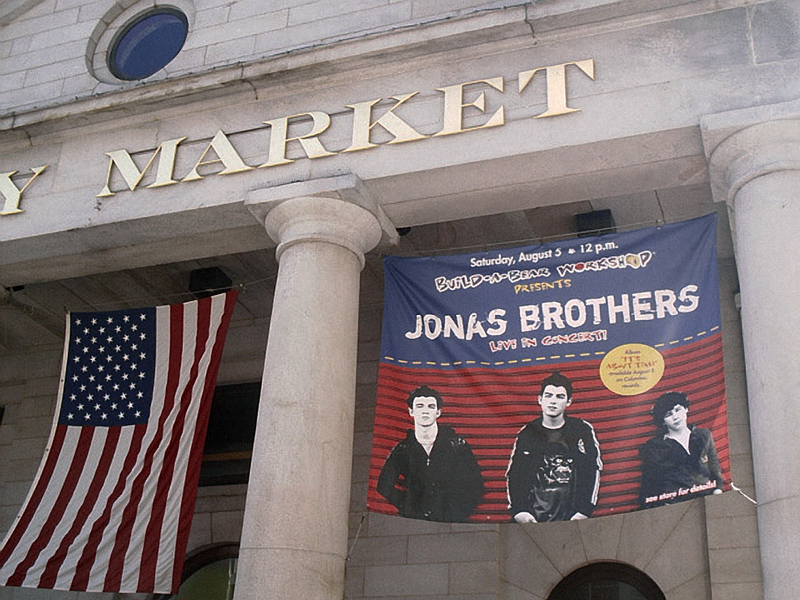 • August 2006, the Jonas Brothers performed LIVE in our Faneuil Hall Marketplace store. • March 2007, we sent the winner of our Friends Rock Sweepstakes to see them LIVE in concert at the Hannah Montana Best of Both Worlds Tour. 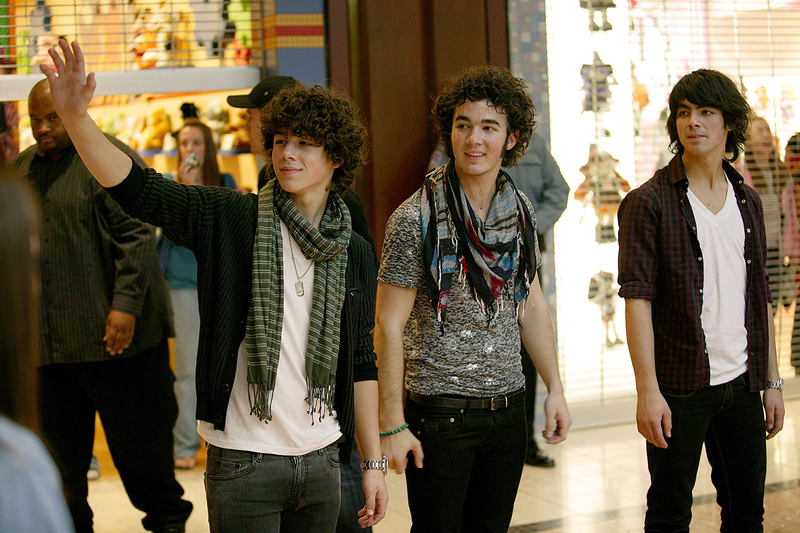 • October 2007, they made a special appearance at our 10th Birthday Celebration at the Saint Louis Galleria. 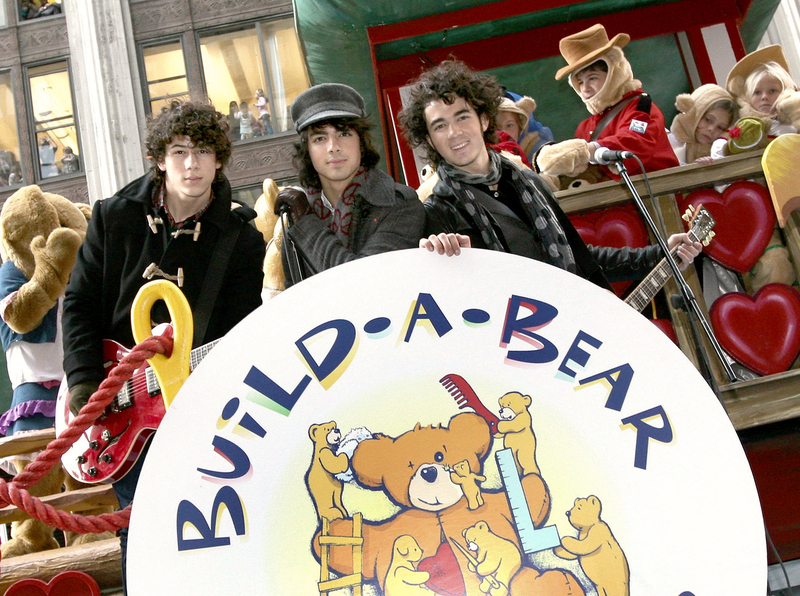 • November 2007, they performed their hit song “S.O.S.” LIVE on our float at the Macy’s Thanksgiving parade. • AND…COMING SOON: September 2009 you can ROCK and ROLL with our NEW JONAS dog! Yes! NOW the Jonas Brothers are bigger than EVER and we’re excited to announce the launch of this NEW furry friend coming to a store near you September 26! Guests can make friends with this cute and cuddly rock star that includes an exclusive dog tag necklace and virtual guitar at buildabearville.com. It is soooooo soft too! And that’s not all! To cele-bear-ate the arrival of this rockin’ new friend FOR ONE NIGHT ONLY, Friday, September 25 from 6 – 8 p.m. we’ll host the JONAS Mania VIP Party! This is sneak peek event at EVERY store where Guests can be one of the first to make JONAS Dog. PLUS each dog will include a FREE shout-out recorded by the Jonas brothers. This is HUGE. The Jonas Brothers recorded this very special message just for our Guests and it’s ONLY available at this event with the purchase of Jonas Dog. This is sure to generate a lot of BUZZ and word-of-mouth advertising! Check with your local store to see if they have any openings. ONE shout-out available per JONAS Dog purchase. Limit 2 shout outs per Guest in attendance. Plus, just for attending Guests will receive a FREE backstage pass wristband and a FREE Jonas Brothers headshot with an exclusive virtual gift – a skinny vest and tie for their online character at buildabearville.com. Don’t wait, come celebrate Jonas Mania with us! If you can’t make it Friday night, don’t worry we have plenty of Jonas dogs so come as soon as you can. I will be at our store in St. Louis standing in line…I hope I can sleep, I am so excited! It never ceases to amaze me how universal the hug of a teddy bear is. No matter where I travel or how far away from the USA I am I see children cuddling their furry friends and the Middle East is no different! Smiles abound in every language! 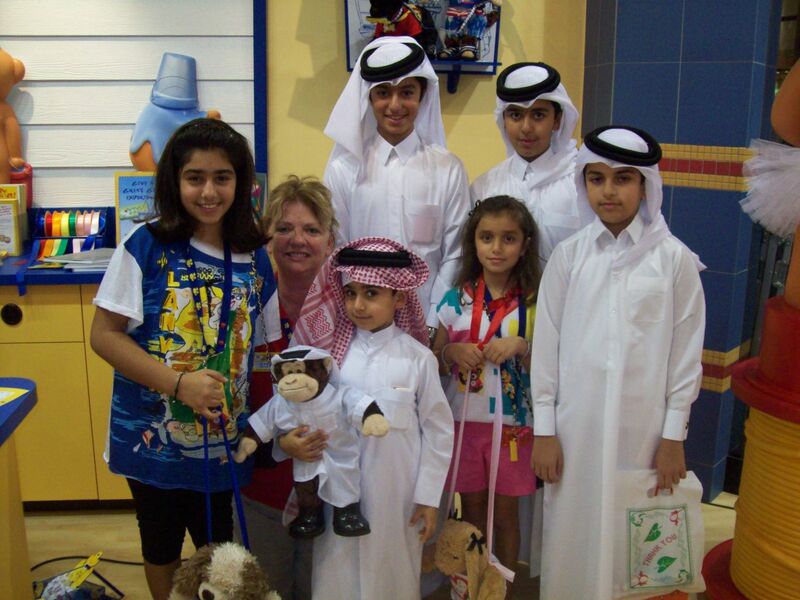 Build-A-Bear Workshop opened this past week in Dubai to a throng of happy Guests. Dubai – The city that has risen from the desert has everything from the Burj Al Arab to the “The Needle in the Sky” (the Burj Dubai), indoor ski slopes within a mall, Palms and gigantic man made creations in the Arabian Gulf is now complete as it has it’s very own Build-A-Bear Workshop at the Dubai Festival City Mall. Festival City is the first of many stores to open in the Gulf States and none too soon! Our first requests for stores in Dubai probably came about 8 years ago. 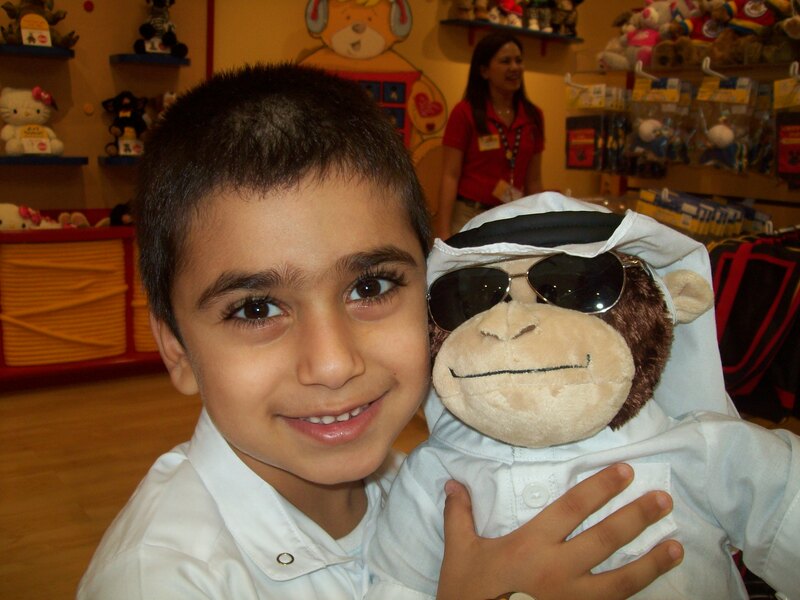 Visitors and residents of Dubai crave the best brands of the world and Build-A-Bear Workshop is no exception. When we expand overseas we look for business partners who have the financial resources and experience to help recreate the magic that we have created in the USA. We are BEARY picky! While we want our Guests to have an easy and fun experience, it takes a lot to make this happen every day. The most important ingredient for success are great Bear Builders who understand what it means to make children of all ages smile. Thanks to our great leaders Zeyad and Anders and the support of Bear Builder Trainer Extraordinaire, Kathi Scott , we recruited a GREAT team and had a FURBULOUS opening! At BABW we absolutely want to change lives through the hug of a teddy bear and one way we show our true hearts is through our partnerships with our landlords and other business partners. 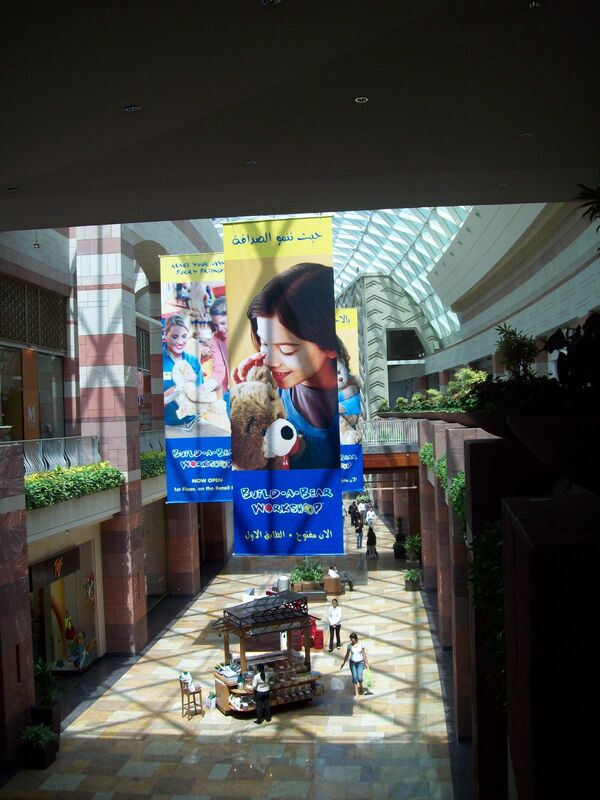 These signs in the mall are an example of what can result as are the sales which doubled the projections! Children are amazing people and that is why so many of them are my friends. I am inspired by their hearts and souls and creativity. I am encouraged by how they see the world and how they deal with adversity. That is why I do what I do. I have the best job in the world. You are currently browsing the Maxine Clark's Blog blog archives for September, 2009.